MOUNT VERNON. 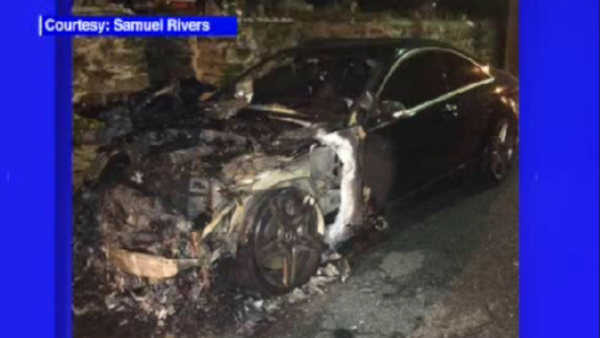 New York (WABC) -- A community activist known for challenging local elected officials on the ballot, in the courts and online is claiming his car was intentionally set on fire. The Journal News reports Sunday that police are investigating the Friday night blaze as suspicious. Activist Samuel Rivers tells the newspaper he's being targeted for exposing corruption. A spokesman for Mayor Rich Thomas called Rivers' claims "unequivocally false." Samuels has a long history of publicly challenging those who run his suburban New York City town. He has run unsuccessfully for state assembly and City Council seats, filed a lawsuit challenging a former mayor's eligibility to run for office and in blog posts raised questions about Board of Education spending. Last month he accused a police officer of firing wantonly in a street. Police called the car fire outside the Mount Vernon home suspicious. No one was injured, and the car has been impounded. Police have confirmed this is an active investigation.